In the footsteps of W.L. Wyllie R.A. I have read your book with great interest and a pang for how Spice Island used to be. I have always loved Wyllie's work, what is so important is to keep the memory of one of our greatest marine artists alive, so naturally I loved your book. It was not just that the subject interested me, it is a lovely evocation of this area, and a reminder of one of Portsmouth's most famous citizens. Sir Robin Knox-Johnston, CBE. RD*. Very innovative and valuable, indeed a superb piece of curation. I must congratulate you on the book, I am sure many collectors will appreciate it. A fascinating study of Wyllie and Old Portsmouth, profusely illustrated, of equal interest to Wyllie fans and the general reader. Nigel Surry. 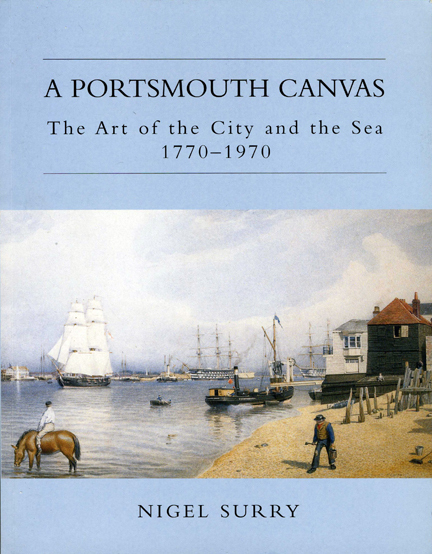 'A Portsmouth Canvas, the Art of the City and the Sea, 1770-1970.' The Fortune Press, 2008. Through the reminiscences of members of the Wyllie family, a trail map and 335 photographs including Wyllie etchings and paintings pictures from Wyllie family albums and views of Old Portsmouth c.1906, Nigel Grundy takes the reader on a tour through the historic streets of Old Portsmouth visiting places and properties linked to Wyllie and his family and traces some of the local and world events they were involved with from 1906 until 1931. Tower House, Wyllie's family home and studio for 25 years, events on the terrace, 'Wyllie's garden,' the Wyllie's contribution to the war effort, the loss of two sons in World War 1, the site of his tram shed studio and his links to Portsmouth Sailing Club are among many of the events recalled. 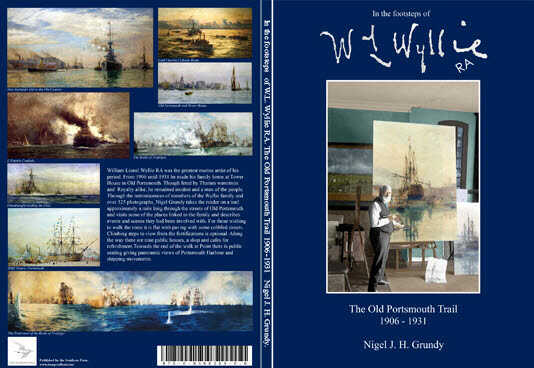 The book is a good introduction to Wyllie's Old Portsmouth and would make an excellent companion for anyone wishing to visit the area and spend some time familiarising themselves with a part of the old town that Wyllie would have known. For those wishing to walk the route it is flat paved with some cobbled streets and climbing steps to view from the fortifications is optional. Along the trail there are nine public houses, a shop and cafes for refreshment. Towards the end of the walk there is public seating at Point from where a panoramic view of the Spinnaker Tower at Gun Wharf, Portsmouth Harbour and the busy comings and goings of shipping can while away the hours. W.L. 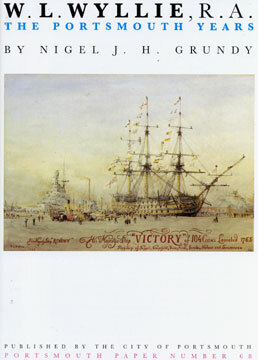 Wyllie RA, The Portsmouth Years, by Nigel J. H. Grundy. 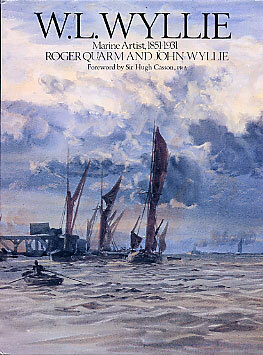 'This is a welcome and attractive memoir of one of Britain's most distinguished marine artists. Nigel Grundy sketches in the life and times of Wyllie, explaining both the private tragedies which afflicted him, such as the loss of two sons in the First World War and the death of a handicapped daughter, and the artistic influences, of which Turner was the most significant, which shaped his development as a painter. Wyllie's devotion to ships and the sea is lovingly expounded and his part in preserving HMS Victory for the nation is deftly handled. The booklet is well illustrated with several of Wyllie's paintings including the famous panorama of the battle of Trafalgar and several examples of Wyllie's contemporary work, such as a splendid depiction of the British battle cruisers going into action at Jutland. 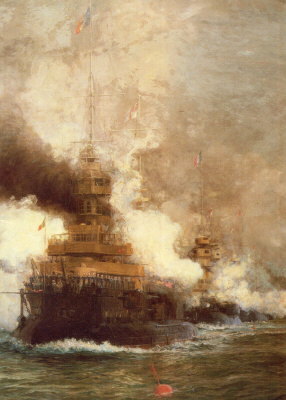 Because of delays in paperwork Wyllie was unable to accompany HMS Invincible into action at Jutland as he had hoped to do, which gives an added poignancy to his painting of the loss of that warship, though this painting is not included in the brochure. There is, however a vivid centrespread in colour of HMS Bellerophon in Portsmouth Harbour with HMS Victory in the background. Anyone who shares Wyllie's enthusiasm for the sea and the majesty and beauty of ships will find this handsomely produced booklet a source of delight and information'. W.L. Wyllie, R.A.: the Portsmouth Years, by Nigel Grundy, Portsmouth Paper, 68, 1996.Pp.28.0 901 559 96 2. This 28 page A4 publication is illustrated with 23 black & white images & 3 colour images and includes a colour centre fold of H.M.S. Bellerophon in Portsmouth Harbour showing HMS Victory in the background in 1909. William Lionel Wyllie & L'Entente Cordiale exhibition. Catalogue from the exhibition, 'W.L. Wyllie & L'Entente Cordiale', 1988, is only available from Chris Beetles. 1988 - 24 pages - 17 B/W & 16 COLOUR images. W.L. Wyllie, Marine Artist, 1851-1931, by John Wyllie and Roger Quarm. This book is available from Chris Beetles not this website. 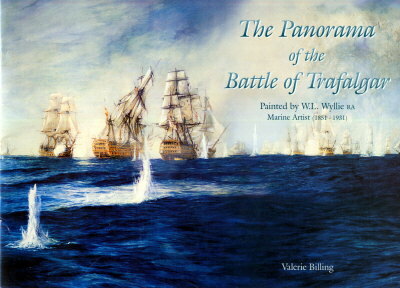 The Panorama of the Battle of Trafalgar, by Valerie Billing. This 22 page, A4, illustrated publication chronicles the history of Wyllie's Panorama of the Battle of Trafalgar & is available from the National Museum of the Royal Navy in Portsmouth. 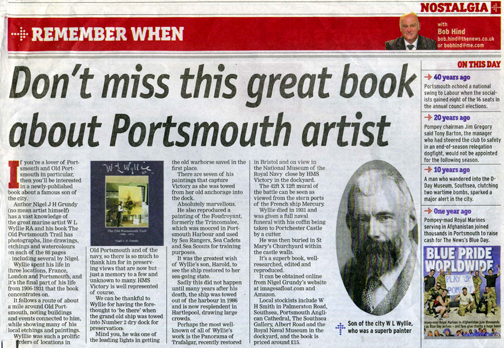 If you enjoy the exploration of Wyllie's Old Portsmouth, you will also find Nigel Surry's 'A Portsmouth Canvas. The Art of the City and the Sea 1770-1970 (The Fortune Press 2008) of considerable interest, as a wider study of Portsmouth and its artists for over two centuries. Please go to www.fortes.org.uk for further information, or tel: 01787 370953.